In this week’s Throwback we set the wayback machine to 1989 and the Japanese 500cc Motorcycle Grand Prix at Suzuka. The race will go down as one of the all-time greatest one-on-one battles in GP history between American archrivals Kevin Schwantz and Wayne Rainey. 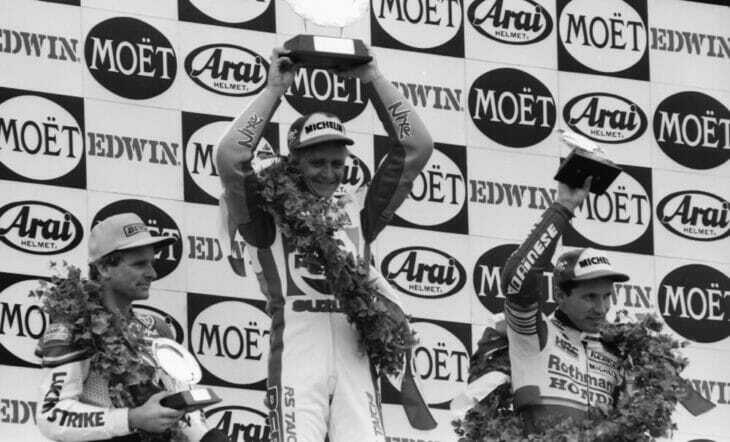 Schwantz on Suzuki and Rainey aboard a Yamaha, swapped the lead numerous times in the race. The battle was intense. Neither wanted to let the other lead. Schwantz got by Rainey on the final lap with yet another of several aggressive passes. Unfortunately for Rainey, he hadn’t seen the white flag and didn’t realize they were on the final lap. He was waiting to make one last move for the lead, but when the duo came on the final straight he saw the checkered flag and frustratingly realized his mistake, swinging his fist in frustration as Schwantz lift his in victory. Near the end of the race Eddie Lawson worked his way up to third making it an all-American podium.